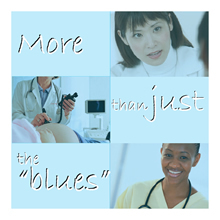 There’s a big difference between what is known as the “baby blues” and perinatal and postpartum depressions (PPD). For many new moms, the change in hormones, the stress of labor and delivery and the change in schedule when a new baby arrives can make them feel tired, crabby and a bit down… more commonly known as the “baby blues.” Some extra pampering, a healthy diet and rest can make a difference. True PPD is a clinical depression that affects approximately 10-20 percent of all childbearing women. It’s a real medical condition that can strike pregnant women and those who have just given birth up to the baby’s first birthday. PPD might or might not strike women who have risk factors, such as a family history of depression, or it can impact those with no risk factors at all. While it is a mystery what triggers PPD, we do know that it is treatable using self-help techniques, support from a new mom’s social network, professional counseling and even medical counseling when needed. Get help right away if you ever have thoughts of harming yourself or your baby! Call your health care provider or doctor. If it is an emergency, call 911 or your local emergency number. To order any of the following brochures, click here.